As befits the political powerhouse of the nation, and perhaps even of the world, Washington DC draws thousands of tourists every day who come to see the iconic sights, visit the superb, usually free museums and generally have a wonderful time. While weighty political matters are being debated behind some of the beautiful façades, visitors can enjoy the green parks, top-notch restaurants, energetic nightlife, quality shopping, and buzzing bars. Anyone who has a dime to see where world-changing decisions are made should travel to Washington DC, where a wealth of historic sightseeing attractions awaits. The best time to travel to Washington DC is during the seasons of spring and autumn (April, May, September and October), although the hot, humid summers (June to August) remain high season for tourists. Winter (between December and February) can get uncomfortably cold with temperatures usually hovering just above the freezing mark. Read more on Washington DC's Climate and Weather. -Stand in Ford's Theatre, envisioning the assassination of the beloved President Abraham Lincoln. -Watch a performance at Kennedy Center, the busiest performing arts centre in the US. -Admire the impressive collection in the National Gallery of Art. -Trawl the many fascinating museums of the Smithsonian Institution. -Play at espionage at the International Spy Museum. -Visit the Giant Pandas and many other exotic animals in the National Zoo. -Take a tour of the White House and imagine life as a US president. -Climb to the top of Washington Monument and enjoy the view. 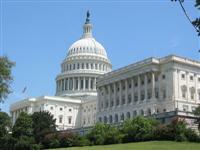 Washington DC is bordered by Virginia and Maryland, with many exciting attractions nearby. Popular excursions from the city include Mount Vernon, the former plantation home of George Washington; the Arlington National Cemetery, just outside the city; and Old Town Alexandria, in Virginia. International flights land at Washington DC's two major airports, Baltimore-Washington International and Washington-Dulles International. Get more information on Airports in Washington DC. -There is approximately one lawyer for every 19 residents in the city. -A rock from the moon is on display at the National Air and Space Museum. -More wine is consumed per person in Washington DC than any other state in the US. Nicknamed the capital of the world, Washington, D.C. is a city unlike any other, with its low-profile skyline, green parks and open spaces, grand buildings, historic landmarks, marbled monuments, and world famous museums. Besides its world-famous sights, exploring this cosmopolitan city is a joy in and of itself, through eccentric neighbourhoods that support a thriving cultural scene, with scores of top-notch restaurants, shops, and night-time entertainment. The US capital is an international hub of power and diplomacy, commanding the political centre stage for one of the most powerful nations in the world, and representing all the democratic ideals that the country takes pride in. After politics, tourism is the capital's main industry. The city plays hosts to millions of people annually who come to explore famous sights such as the domed US Capitol, the stately White House, Lincoln Memorial, and the soaring Washington Monument. The most well-known sights are located along the National Mall, a green park stretching from the US Capitol to the Lincoln Memorial on the Potomac River, and include several memorials to great US presidents of the past, as well as the outstanding museums of the Smithsonian Institute. As an added bonus, almost all major attractions in the city are free. Besides political and historic sights, Washington is a city of interesting neighbourhoods, each with its own character and culture. The most famous of these is historic Georgetown, with elegant colonial houses, boutiques, fancy restaurants, and a lively nightlife. One of the most colourful neighbourhoods is the bohemian district of Adams-Morgan with an assortment of funky shops and ethnic stores, while the arty suburb of Dupont Circle is an affluent business and residential area, with excellent restaurants, art galleries and shops that forms the centre of DC's gay community. While it's possible to see all the sights of Washington that we've come to know from history in a day or two, it would take months to truly experience all the locals know and love about their city.